I got this back in 97 if I'm not mistaken. Its powered by a Yamaha receiver/ amplifier I purchased this with a set of LS 12 Cerwin Vegas. For a surround system that I still use to this day. Its crazy to think how old it is and still have it perform like day one. I never had the desire to upgrade as I have always been pleased with that as well as a center speaker and two rears. 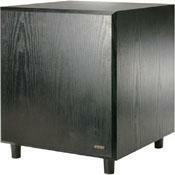 Anyway the Advent subwoofer sounds great and can be adjusted for your style of music. If you listen to rock you can tighten it up so it sounds like a kick drum right their in your ear or r&B with that Low 30 megahertz bass tracks. In the 20 years I owned it I finally had to replace the surround which I was able to get for 7.00 shipped to the door. It even came with the glue and instruction but I watched a how to video to make the repair. I now plays as well if not better than OEM. I have an Onkyo 760 HTB system - just could not stand the speakers packaged with the system - horrible for music! Great for movies. I decided to upgrade the entire speaker suite - Hello Ebay! I now have Pinnacles all around and needed a sub - ENTER the Advent. Music sounds very good - This subwoofer will not plum the 20hz region - but it'll do 35hz nicely! Bass is rich, full - not boomy! I have the sub in a small room - power is sufficient. Truthfully - it probably could not cut it in a large area. I know there are better subs available - but you'd need to spend $300.00 dollars to get better. The controls are easy to use, auto on-off, suffient power (small area). It is attractive - all for $80.00 Shipped! If you are looking to peel the paint off of your walls - look elsewhere. If you are looking for a sub that plays musical bass at a bargain price-this thing will fit the bill. My Onkyo sub 8 inch just wasn't musical! For the price it's an excellent value for a 12-inch sub-woofer. However, I experienced a problem with the unit powering itself off during quiet times in a movie and not powering back on when bass was received. As per Advent technical support, the first fix is to raise the "Level/Volume" control. This will allow more signal to pass to the sub and should stop the power down of the unit. If that does not work, Advent requests that you remove the amplifier portion of the sub (remove 4 screws and 2 wires) and send it to them. They will add a transistor to the input, which will solve this well known issue. Advent technical support was very good to deal with.